Now in their seventh running of the Pod and Planet Fiction Contest, YC120 (2018 for non-capsuleers) is shaping up to be one of group’s largest. This year’s contest will again have three categories: Lore-Based; Ingame-Based/Freeform, and Humo(u)r. With the grand prize winner taking aboard 10.5 billion ISK in prizes, better get at least a single entry in, as you can’t win without submitting. Currently, the prize pool totals over 71 billion ISK. This is purely thanks to donations from players within the community. Prizes are slated to be a mixture of PLEX, item loot (based on the Empire v. Republic Tiff theme), and cold hard cash. “Kind and generous people” tend to donate additional loot as the event progresses meaning the exact details for each category may increase as the event goes nears the end. “Nothing [EVE] is certain.” -H.S. Crow (paraphrase). The larger prizes will be in this “standard works,” canon-focused category. That’s because the body of lore in the Chronicles and EVElopedia is rich, detailed, and huge, and we think it deserves more exploring. Also, because writing within the canon requires more attention and care. And finally, because each year this category gets the most entries and thus the toughest level of competition. The Grand prize usually goes to the best story in the “8,000 Suns canon-faithful” category, but should a story from either of the other categories get a score that really outstrips the best in 8,000 Suns, it would nab this prize! 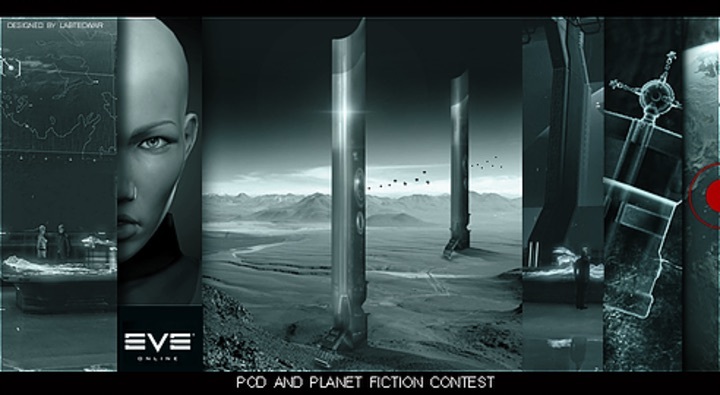 Stories submitted for this category require being set within the official canon of New Eden, similar to the EVE prime fiction Chronicles. Entries can be about baseliners or about capsuleers, but it should not mention an in-game player character, corp or alliance. In short, stories for “8,000 Suns in New Eden” should be set in the prime EVE fiction. Guidance on the standards for conforming to the lore can be found on the Pod and Planet site. Stories in this category can be true, somewhat true, or completely made-up tales of miners, mission runners, manufacturers, pirates, scammers, spies, and other heroes, rogues, and opportunists of EVE, or just about any pilot. Stories can involve actual in-game events, and mention player characters, corps, alliances, real in-game events, or “player-driven content,” is allowed. Basically, writers can produce stories that don’t need to conform with canon. If you want to write a story about your corp and its members, a stroke of pvp tactical brilliance, a corp infiltration, a local chat encounter, etc., it should go here. “Other Things Just Make You Swear and Curse” is the humor/humor category. Aside from the story beingEVE-themed there are no specific rules for this category. However, a humorous story, “Preferably, to other people also, as well as to yourself,” will help you. Cross category prizes for entries of 750 words or less. Please note that a story winning one of these prizes can also win one of the the three main category prizes. Eight winners will be chosen from top-scoring entries across the three categories. The contest will run from October 1, 2018, 2018 to November 11, 2018. Entries must be received by 23:59:59 EVE server time on November 11, 2018. To be fair to everyone, any late entries cannot be considered as contest entries. But we can still post the story in the Reading Bank for everyone to read after the end date, or before. Works can up to 5,000 words long. While the maximum word limit rule is rigid, There isn’s a minimum word limit. If your shorter story is ready to go head-to-head against a longer one, that’s totally fine. (That’s what the Very Short Fiction prizes are for. To be eligible, the story must have 750 words or less). The work must be your own, this should be obvious, but it is stated here. The work must be a new and not have been posted or published before. Sorry, we have to follow a bright-line, no exceptions rule on this, otherwise the event could get flooded with any number of EVE-based stories written over the years. We can’t ask our judges to read through a large number of older stories. If you have an older work you want to share, we’re very happy to link it for everyone to read on the Reading Bank page, but we can’t enter it in the competition. Entries have to be in English, only because that’s a language that the most people in the community can read. If English isn’t your first language, don’t be shy. A story doesn’t have to be in perfect grammatical English to be good. A work can only be entered in one category. You can enter as many works as you want. Entering multiple stories in the same category, or across different categories, is encouraged. Write as much as you can. Trolling entries or any work that disparages or is abusive of any real-life member of the EVE community will be rejected. Writers just need to use common sense on this. Stories can have mature language or content, within reason. If we feel that the general community of EVE players would find a work offensive, the work will not be entered into the contest. ​We recommend using your word processor’s spell check before you submit the work. You worked hard on your story– why let little cosmetic errors hurt its overall impact? Prizes – As previously stated the prize pool can grow and more chances to win. Writing Help – Especially with the category “Eight Thousand Suns in New Eden” there is help listed for EVE Lore. Supporters – Would you like to contribute to the prize pool, or see how has? Check the link out. If you’ve never written before, do not be afraid to submit an entry. And if English isn’t your first language, the same is true. EVE News 24’s own Jenne Exupery covered last year’s contest and it is still a great read. If readers know of other great coverage or pieces talking about hints on how to win, drop a comment and we will update this section. For anyone interested in Science Fiction and especially for those that love New Eden lore, just reading can be a real treat. Still throw a couple hundred words together and take a shot at winning some serious ISK! It is reported that only eight stories have been entered so far, and 27 prizes to be awarded the math is fairly easy, you have a good chance of scoping some ISK. For the Pod and Planet Contest runners, hit us up as we found it hard to find where to donate to this great project! in fact nice, every one be capable of effortlessly be aware of it, Thanks a lot. Its like you read my mind! You appear to understand so much about this, like you wrote the ebook in it or something. I feel that you could do with some p.c. to force the message house a bit, however instead of that, that is great blog. An excellent read. I’ll definitely be back. I just want to tell you that I’m beginner to weblog and honestly enjoyed you’re web-site. More than likely I’m want to bookmark your site . You definitely come with amazing article content. Bless you for revealing your website. Just how could I create blog sites or short articles and get paid for it? 57o3QS Thanks a bunch for sharing this with all of us you actually know what you are talking about! Bookmarked. Please also visit my site =). We could have a link exchange contract between us! 1XC8uj This is a really good tip particularly to those new to the blogosphere. Brief but very accurate information Thank you for sharing this one. A must read article! What is the easiest way to duplicate my WordPress blog sites to a new hosting company?